The decisions made in creating an investment portfolio can be impacted by dozens of factors including the product a company manufactures or produces, the company’s aim toward social impact, an anticipated rate of return, and the aim of the investments overall (growth, security, income, etc.) but an investor’s willingness to risk investable assets in order to receive a potentially greater rate of return colors every decision, and is one of the first decisions an investor makes. Advisors almost always ask about and respond to an investor’s risk tolerance when making suggestions about investment opportunities. However, Spectrem research shows that some investors switch advisors because they do not feel their original advisor properly respects their risk tolerance level. Understanding how investors determine their risk tolerance level and amount is key to understanding an investor’s thinking on a variety of other topics related to product and company stock selections. The study suggests many of the influences investors consider and can point advisors to the influences most likely to play a role in any investor’s decision-making. Spectrem’s new study, Portfolio Decision Making, asked investors how they decided what products they would include in their portfolio. One of the questions asked was how each investor’s attitude toward risk impacted their portfolio. For a majority of investors, the decision on how much risk to place upon their investable assets was made primarily by the investor. Fifty-three percent of all investors said they decided how much money the were willing to lose to determine how they were going to invest. That was obviously a bottom line decision, and was more often made by older investors (56 percent of World War II investors) than young (only 47 percent of Millennials). However, approximately one-quarter of investors (23 percent) made the decision based on timing more than a sum they put into play, saying they determined their planned retirement age and then made the decision based on a life calendar of sorts. 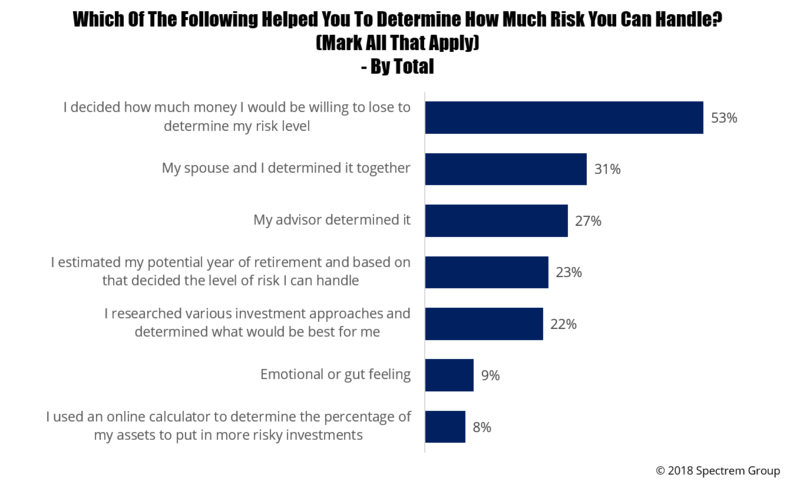 Only 27 percent of investors said their advisor played a role in determining their risk tolerance, and that percentage was similar among all age groups. However, among wealth segments, the wealthier the investor, the less likely they were to involve their advisor in deciding how much risk to include in their investment strategy. Wealthier investors were more likely to make the decisions by doing their own research. Simple arithmetic did not work. Only 8 percent of investors used an online calculator to determine the percentage of assets to put into risky propositions. Nine percent admitted they just went for it based on a gut feeling about what they wanted to risk.